This week I talked with filmmaker Michele Josue about her new documentary Matt Shepard Is a Friend of Mine. This October will mark 15 years since Matthew Shepard was kidnapped, tortured, tethered to a fence outside Laramie, Wyo., and left to die just because he was gay. Never regaining consciousness, Shepard succumbed to his severe injuries and died on Oct. 12, 1998. Though Shepard has since become a powerful political symbol within the movement for LGBT equality (in 2009 President Obama signed the LGBT-inclusive Matthew Shepard and James Byrd Jr. Hate Crimes Prevention Act), the film opts to explore his human side. Josue, who was a close friend of Shepard's (they met while attending The American School in Switzerland), travels to pivotal locations in his life, interviewing his other friends and family members and gaining insight into the young man's beautiful life and devastating loss. The film will have a bicoastal world premiere on Oct. 4 at both the Mill Valley Film Festival in California and the Washington National Cathedral in D.C. Gay or straight, I think that everyone should have a commitment to LGBT civil rights. You know, gay rights are human rights, and the struggle affects all of us. For me it's really important to stand up for my gay family members, my gay friends, Matt and all the Matt Shepards out there, to fight for their rights to be acknowledged as equal members of society, deserving of every equality that everyone else has. I believe we all have a tremendous responsibility and obligation to each other as human beings to stand up for each other. So I feel strongly about our film about Matt. It's a shame that our story can only aid the education process of those who still don't believe in equal rights for everyone. So through the film I'm trying to do my part for LGBT equality. 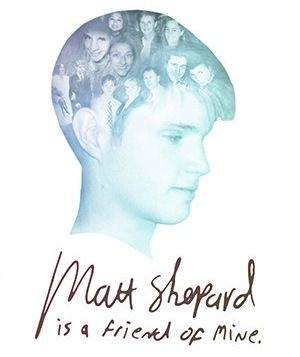 Matt Shepard Is a Friend of Mine is currently playing the film festival circuit. For more information, visit mattshepardisafriendofmine.com.